VANCOUVER, British Columbia, Canada, May 19, 2012 (ENS) – The Wilderness Committee and the British Columbia Government Employees Union are offering a C$5,000 reward for information leading to the conviction of those responsible for poaching an 800 year-old red cedar in a provincial park on Vancouver Island’s southwest coast. 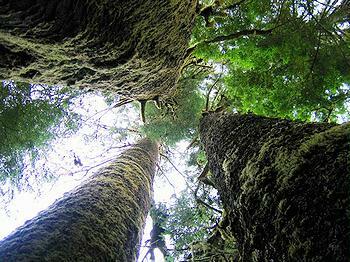 Located near the parking lot of Carmanah Walbran Provincial Park, the giant cedar was nearly felled by illegal loggers last year. The poachers cut 80 percent of the way through the tree but were unsuccessful in toppling it. Still, the ancient cedar was so damaged that BC Parks staff had to cut it down for safety reasons. Afterwards, the poachers returned to cut up and haul out most of the tree. Poachers were still removing sections of the cedar over the last several weeks. Only one section of the trunk remains in the forest, along with the stump, which is nine feet (2.74 meters) in diameter. This vandalism of protected old-growth forests is a direct result of cuts to the BC Parks budget, say the organizations offering the reward. “We are offering a $5,000 reward for information leading to a conviction because someone needs to stand up for BC’s parks and our provincial government clearly isn’t doing the job,” said Gwen Barlee, policy director with the Wilderness Committee, Canada’s largest citizen-funded wilderness preservation organization. “Hopefully the reward will result in someone coming forward to the RCMP, and these poachers will answer for this criminal act,” Darryl Walker, president of the British Columbia Government Employees Union. “These kinds of incidents are the unfortunate result of having too few eyes and ears on the ground to protect our public parks,” Walker said. British Columbia has only 10 full-time permanent park rangers to patrol 1,000 parks and protected areas covering 14 million hectares (54,054 square miles). In the summer months 87 additional part-time park rangers are hired, but even at the temporarily increased numbers there is just one park ranger to patrol 10 provincial parks. Carmanah Walbran Provincial Park is 16,450 hectares (63.5 square miles) in size. 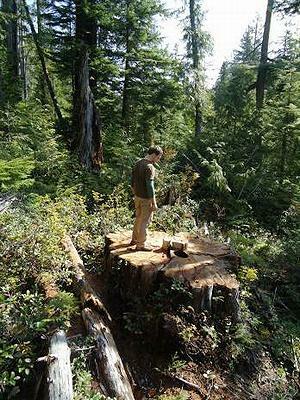 As the poachers removed the remains of the ancient cedar, they further damaged the environment, says Torrance Coste, Vancouver Island campaigner with the Wilderness Committee who visited the site last weekend. “Undergrowth in the park is torn and crushed, a ditch is caved in and blocked with debris, small concrete parking stops have been moved or broken, and steel cables are lying around,” he said. Coste is currently in discussions with parks officials and the Royal Canadian Mounted Police. BC Parks staff are seeking funds to remediate the damage. The Lake Cowichan RCMP has been contacted, but enforcement in the Carmanah area is difficult due to its remote location, 20 km (12 miles) northwest of the nearest town, Port Renfrew. The lower Carmanah Valley was declared a provincial park in 1990, and the Walbran and upper Carmanah valleys were added to the park in 1995, protections that the Wilderness Committee campaigned to achieve. Access to the park is only on private logging roads. The park contains a Sitka spruce ecosystem amounting to about two percent of BC’s remaining old-growth forest. These are some of the world’s largest spruce trees, reaching heights over 95 meters and living for 800 years or more. Clinging to the side hills of the park are ancient, gnarled cedars, some estimated to be over 1,000 years old. The management of parks has been a hot potato for successive British Columbia governments. A series of unpopular measures have been introduced over the last decade. Provincial governments have weakened the Parks Act and changed park boundaries to allow for industrial development. The operating budget has been slashed, reducing the number of park rangers by over 50 percent, and government-funded park interpretive programs have been axed. Since 1999, the number of visits to BC parks has dropped by more than 20 percent, a decline that Barlee says has not seen in neighboring jurisdictions such as Alberta. On Thursday, BC Environment Minister Terry Lake announced that BC Parks is getting an extra C$3 million for this year’s capital budget, a 27 percent increase over last year. The funding is directed to facilities upgrades, rather than staff increases.